Waking up to more ice on the inside of your windows than on the outside can make you shrink back under the duvet for an extra five minutes of warmth! So why not consider insulating your home this winter? Five reasons why you stand to benefit from insulating your home? How to insulate your home more effectively? By insulating your loft and cavity walls, you can significantly reduce the amount of heat that escapes out of your home during the winter months. So how does insulation work? Up to 35% of the heat from your home can disappear through walls that are not insulated. Houses that were built between 1924 and 1982 are likely to have been built with a gap between the external and internal walls, known as a cavity. By insulating this gap, you can retain the warmth in your home that will ultimately save you money. Properties built after 1983 should already benefit from cavity wall insulation. Your loft is an open space where heat naturally rises and escapes. 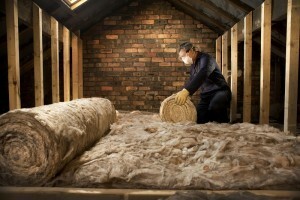 By using loft insulation, warmth is trapped inside your home during the winter. In the summer, heat is kept out, meaning your home stays cooler. The insulation is made up of mineral wool that can be laid out between the joists on the loft floor. It’s recommended that your insulation is at least 11’’or 270mm deep. This will not only keep you warmer, but will ultimately save you money on your energy bills. Homes built after 1st January 1991 should already be fitted with sufficient loft insulation. Free grants from the government are available to all homeowners and those who privately rent, regardless of your age or your financial position. They are available throughout the UK, although there is a limited amount of funding, so it’s important to get your name down early. Capture heat from the sun – South facing windows attract sunlight and let in warmth during the day. Make sure your curtains are open to maximise the heat coming into your home. Attach clear plastic film to the inside of your windows – this can stop cold drafts getting into your home. Use curtains and blinds to help insulate the windows in your property – close them at night so they act as an additional barrier. Adjust your thermostat to a comfortable level when at home. Remember, the higher you crank up the thermostat, the more it will cost you to maintain. When you’re away, you can reduce it down to approximately 10 degrees to protect the pipework from freezing, reducing your heating bill. Service your heating system and sweep any working chimneys. Potential problems can be found before the winter sets in and from a safety perspective, it’s important to make sure there aren’t any operating risks such as dangerous emissions or birds nests in the chimney flue. Seal off any open chimneys that you don’t use. This will significantly reduce the down draft in your home and will help stop heat escaping. Use ‘LED’ Christmas lights rather than traditional bulbs. They’re cheaper to run over the festive season! So this winter, don’t sit with a blanket over your knees, clutching a hot water bottle as you watch your favourite TV drama. Enjoy the warmth, knowing the money you’re spending is staying in your home rather than melting the snow outside!